To identify natural groupings in the data. Useful for exploring data and finding natural groupings within the data. Members of a cluster are more like each other than they are like members of a different cluster. The process of clustering is really a process of choosing a good partition of the data. Clustering models use descriptive data mining techniques, but they can be applied to classify cases according to their cluster assignments. 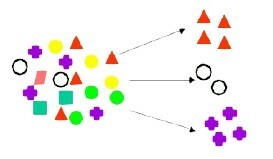 The model defines segments, or “clusters” of a population, then decides the likely cluster membership of each new case. A model might identify the segment of the population that has an income within a specified range, that has a good driving record, and that leases a new car on a yearly basis. Common examples include finding new customer segments, and life sciences discovery.